Please click below to sign this petition, which we will deliver to the U.S. government, the Saudi government, and the United Nations. 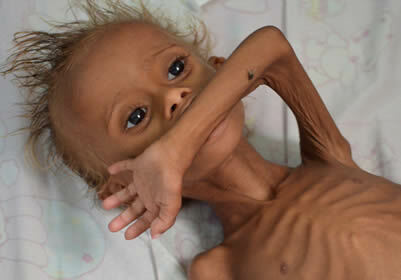 The mass starvation underway in Yemen must be immediately addressed by ending the bombings, missile strikes, and raids; holding those responsible to account; restoring the Central Bank of Yemen to Yemeni control; opening Yemeni ports; and providing food and medical aid on the scale required. 14908 1 year ago Bart Gower Detroit, MI What will we do for Saudi Arabia? 14905 1 year ago John Steven Livacich Redlands, CA That an US ally -- using US equipment and munitions -- can cause such a widespread tragic crisis, is a national shame for the United States. 14904 1 year ago pat westwater-jong Bolton, MA Send the photo to President Trump and all members of Congress, maybe they'll find enough compassion to stop the bombing and siege. 14902 1 year ago Gary Lee Signal Hill, CA Yemeni Holodomor. Do you really want to be a part of this?